Climate change can destabilize existing land and resource governance institutions and associated property rights across the spectrum of landscape types. Transformed climatic conditions, manifested in either rapid-onset or slow-onset ways, can change how land and natural resources are accessed and used as geographical shifts in resource productivity, resource scarcity, and therefore land use patterns occur . In addition, where there are insecure land and resource tenure regimes, such as leasehold rights, rural households are disinclined to invest their time and money for improving their agricultural and water management practices as well as conserving forests, ultimately leading to poor adaptive capacity in the face of climate variability. Here, “tenure regimes” refers to the rights, rules, institutions, and processes under which land and resources are held, used and managed. Climatic change can include manifold alterations involving sea-level rise, changes in temperature and rainfall patterns, water availability, natural disasters, and extreme weather events. In recent years, many rural communities have already incurred significant social, economic, and environmental costs from such transformations in local production systems. Climate change can instigate a wide range of tenure-related impacts that include growing competition for access rights to productive natural resources, greater potential conflict over the legitimacy of existing property rights, forced displacement, short-term and long-term migration, land and resource degradation, and alterations in asset values of land and natural resources . Land and resource tenure systems in specific types of landscapes such as coastal areas will be exposed to numerous challenges from flooding, sea-level rise, increased storm surges and altered fisheries conditions that can create infrastructure damage, settlement displacement, and threaten coastal resource use in low-lying areas. In many landscape types, responding to climate change means households having to push for access and use rights over those areas where production is still viable, or moving to new locations altogether in the search for land or water. Poor and vulnerable members of communities, be they women, children, the elderly, specific ethnic groups or those lower in the social hierarchy will be at greater risk of marginalization and physical insecurity than the more elite members because they do not possess the assets, knowledge and ease of mobility to respond to new challenges. Those with weak or non-existing property rights will tend to stay in place in risky and unproductive locations because they ultimately have no options. The specific types of tenure impacts in any given landscape will depend on the type of agricultural production system, as well as levels of dependencies on water, forests and grasslands. The type of tenure regimes can range across the land tenure continuum from informal rights to registered freehold rights. What specific role can tenure and property rights play in building resilience in the face of climate change? How do secure tenure institutions help to achieve the goals of climate change mitigation interventions? Proactively bringing a climate lens to understanding how tenure regimes can strengthen the ability of communities to sustain livelihoods and protect the natural resource conditions is essential. The key is working towards secure enough tenure regimes where rights to land and natural resources are not arbitrarily contested but do not necessarily require formalization of tenure . Although the concept of “secure enough” is somewhat open-ended, developing an effective approach requires a good understanding of the social context within which tenure regimes operate. Given the positive role of tenure in climate change adaptation and mitigation, knowledge on climate change impacts will need to be built up and analyzed in order to identify options for action by a range of land and resource governance institutions at the national, landscape and local level. Given the diverse and complex forms of land and resource tenure systems which are the outcome of deep-rooted historical, social and political factors, rapid forms of tenure assessments within specific contexts are needed to guide the design of policies, laws and programs . For each of these scales, there will be different planning time horizons. This integration process can be called climate-proofing land and resource tenure regimes and involves a set of step-wise actions (see Figure 1). Climate-proofing national land policy and administration is of paramount importance for equitably facilitating effective climate change adaptation and mitigation at the landscape and local levels . Priority will need to be given to supporting those areas with poverty-environment traps . Preparing creatively for long-term development pathways that secure livelihoods, resource regeneration, and environmental conservation in the context of climate change that is inevitably intertwined with ongoing economic transformations and urbanization is a challenging task in which tenure arrangements remain centrally important. Broad-based guidance has been created by a range of global institutions and organizations to strengthen tenure regimes in the face of climate change such as within the Food and Agriculture Organization’s Voluntary Guidelines on the Responsible Governance of Tenure (VGs)  . UN Convention to Combat Desertification , UN-HABITAT  and USAID   . These can be utilized to identify options and approaches for reducing tenure-related risks both in terms of policy, law and administration, as well as the practices of local-level tenure regimes. Given the need to rapidly and cost-effectively support improvements in land law and policy as well as within land and resource tenure arrangements, a number of innovative approaches are being advocated. Climate change variability across a range of environmental parameters will be commonly experienced at a regional or landscape level. Although it is possible to depict broad-brush patterns of tenure regimes in different continents and countries, bringing a climate lens to the landscape level helps to bring into clearer view how a particular mosaic of tenure regimes related to specific types of settlement patterns, agricultural production, and forest as well as water use are affected by changes under different climate change and economic development scenarios. Developing tenure-related interventions at a landscape level permits a holistic approach to supporting the overall mosaic of tenure regimes. For example, within a large river basin such as the Ganges or the Brahmaputra, the distinctive impacts of changing annual rainfall and glacier melt patterns in its upstream, middle reaches and deltaic portions will require different strategies for increasing resilience through tenure-related interventions. Among the enormous challenges faced by these deltaic regions, tenure-related interventions can significantly contribute to building up adaptive capacity and resilience within different resource use areas (see Box 1). Three mighty rivers, the Ganges, Brahmaputra and Meghna meet in Bangladesh’s vast delta area. Not only does severe flooding and river cutting regularly affect this region, but the significant threat of sea-level rise will result in huge numbers of displaced persons, many of whom will join urban slums. The Intergovernmental Panel on Climate Change has predicted that 15 million people will be displaced from these coastal areas if sea level rises by one-meter, and 18 million people if it rises by 1.5 meters . A range of tenure-related interventions are already in the works in this region. The Sundarbans mangrove forests that support both adaptation and mitigation have experienced considerable deforestation as a result of ineffective state-led protectionist management approaches. In order to improve mangrove cover and condition, the Forest Department together with donor support has moved towards mangrove co-management approaches that involve allocating clearer tenure rights for local communities to use and manage mangroves . In parallel, new strategies are being experimented with to help establish tenure rights for slum dwellers in Bangladesh through the creation of community land trusts . Such trusts are non-profit corporations that balance the tenure needs of individuals with the community’s need for access to land, infrastructure and services. This then helps with creating appropriate housing and infrastructure, water and sanitation, and flood control needed for the new migrants moving into urban slums. Climate-proofing land management requires core attention to many aspects of land policy, law and administration  . Broadly speaking, this requires a two-pronged approach: one that focuses on how to support the documentation, recognition and security of tenure regimes as well as safe-keeping of records for those with legitimate property rights (to include such systems as customary, statutory, indigenous and informal), and a parallel one that focuses on incorporating knowledge on climate change into the land administration system. The VGs emphasize the importance of respecting and protecting the legitimate tenure rights of those likely to be affected by climate change, particularly farmers, small-scale food producers and marginalized communities . In particular, it underscores the necessity of addressing tenure concerns where it can lead to conflict caused by climate change or natural disasters. The key is for national governments to identify how existing types of land and resource governance regimes in particular types of production systems will be affected under different types of climate change scenarios. This then enables the prioritization of tenure programs in specific areas or types of settlements so they are empowered to proactively respond to climate change or support mitigation . Given the urgency of the challenges, the question is how to improve the tenure situation through an approach that is inclusive, cost-effective and rapid. For a start, good methodological guidance is now available on how best to record tenure rights  . Additionally, in what way can specific components of a “fit-for-purpose” (FFP) land administration that adopts an accommodative approach by quickly and affordably attaining tenure through a mix of legal and social tenure approaches support climate proofing tenure policy and law? Writ large, innovative approaches such as Namibia’s Flexible Land Tenure Act in its promotion of a Minimum Viable Product that focuses on specific local tenure security needs can provide inspiration for other countries . While FFP is an important approach, the key lies in the detailed design of interventions. Take the case of watersheds in Western Uganda: among the four main types of tenure systems in the area (customary, mailo, freehold, and leasehold), it is leasehold tenure which creates the greatest insecurity for farmers who are disinclined to invest in sustainable land management . This, however, is a multi-layered tenure issue as it is customary land owners who lease out their fragile land to tenants for short-term profitable cash crop production such as tobacco. Policy for improving the security of leasehold arrangements will need to include changes in regulations covering such dimensions as contract templates so that it provides greater gender-equitable incentives for tenants to better manage their land. At a larger scale, where opportunities arise to develop new or amend Constitutions, it is clear they can play a pivotal role in securing tenure rights for specific populations vulnerable to climate-induced displacement or land grabbing. Increasingly, human rights lawyers in Africa are promoting the development of regional policies to support indigenous people’s rights in the face of climate change-related displacements by relying on regional Conventions (such as the 2003 African Convention on Nature and the Conservation of Natural Resources) . Now that there has there been significant progress on refining methods for developing gendered land indicators , this is being taken to a new level by generating national statistics on asset ownership through a gendered lens . 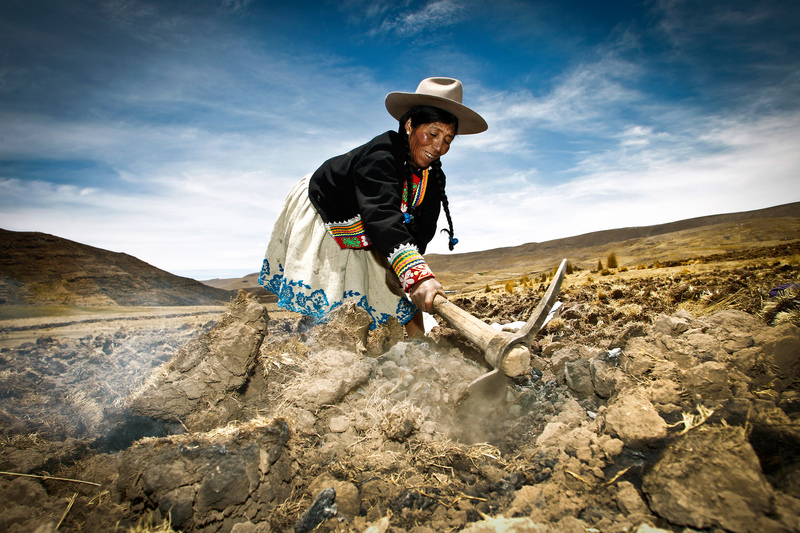 Such information can generate the positive momentum needed to transform ground-level processes for the gender-equitable recognition of land and resource rights. In parallel, the national land administration system will need to be gradually adjusted to incorporate information relevant for proactively facing climate changes. Among the continuum of services provided in climate-proofed land administration systems will be access to data on climate change and likely impacts . In designing specific FFP tools a whole plethora of approaches have come into being that rely on new digital technologies and geographical information systems conjoined with participatory approaches that seek to devolve or localize land administration and planning . As data-management systems become cloud-based, paper records on land rights are no longer threatened by disasters . Data on climate-related risks and disasters as well as on identified safe and secure areas can be more readily integrated into such spatially-enabled information systems. Within the mosaic of tenure forms in any given landscape, climate-proofing tenure regimes will involve identifying which property rights arrangements are contributing to greater social and environmental risks in the face of climate change scenarios and forecasts. An assessment of the types of tenure institutions, be they individualized private property or devolved community-based arrangements over key landed and natural resources, will help to develop a synoptic analysis of the types of tenure governance institutions at work in the landscape. Tracking types of property rights is important because they determine how the welfare benefits become distributed, be they through market or non-market mechanisms . Community-based tenure regimes are able to create social buffer mechanisms such as disaster relief funds, insurance systems or producer associations. A landscape-based approach necessarily has to identify whether there are different or unified governance institutions related to land and specific natural resource. Local adaptation or mitigation plans are often carried out in collaboration with specific types of tenure institutions. In Nepal, for example, climate change adaptation plans are often prepared in conjunction with community forestry user groups. In this tenure analysis, it will be critical to take into account on-going changes in tenure regimes. Economic and political drivers of change can transform community-based resource regimes into individualized ones. Take for example, the overall trend towards land fragmentation widely seen in South Asia that has only served to weaken the capacity to respond to climate change. Another important global tendency is the feminization of agriculture and forest tenure institutions as a result of men’s migration in the face of low income and environmental stresses . Feminization is radically changing the face of the responsibilities borne by women and the elderly who are left behind to manage tenure institutions for sustaining rural production. How to support tenure-related changes in governance systems and property rights arrangements throws up a whole host of questions. Given that landscape-level tenure mosaics will have a mix of different types of authority and power structures governing specific resource allocations and uses, the question of how resilience can be increased through specific interventions needs careful consideration. To what extent is there land grabbing by commercial interests? What level of elite control exists among tenure institutions? Are there democratic processes in place for the responsible governance of tenure? In light of existing political economic dynamics, how can those with no or weak rights, such as in informal settlements, be provided with a secure enough tenure foothold going forward? How can alternative tenure rights be provided in the face of land or coastal resources that have been destroyed or severely degraded? How are tenure-related disputes and conflicts to be mediated? Will systems of compensation be related to tenure rights? A number of FFP tools exist for developing and improving tenure regimes so they are secure enough. 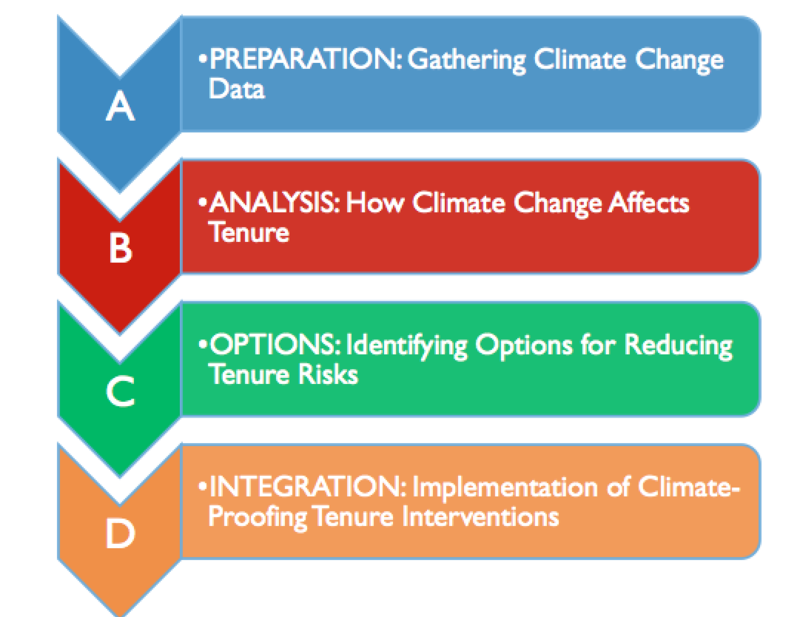 Participatory adjudication and mapping, used to collect and document all types of existing tenure relations in one time, can be adapted to collect additional information on likely climate-related impacts on tenure conditions. Where needed, participatory enumeration, can be part of such adjudication work. Participatory enumeration is an approach developed for informal urban settlements  that can be readily used in other contexts to understand the status of informal tenure arrangements within any landscape. Since it is clear that elite capture of tenure institutions can stall progressive transformation and reform, designing processes for change need to be carefully designed. For example, attempting to enhance gender and social inclusion issues by improving participation, decision-making and benefit-sharing, while critical, is best done by identifying how reforms support both the elite and underprivileged. Appropriate and secure enough tenure regimes at the local level can facilitate participatory tenure-responsive spatial planning so that key stakeholders can jointly anticipate likely climate change scenarios and determine appropriate resource use and settlement patterns  . Such planning platforms can play a vital role in efficiently identifying issues, action and develop positive political momentum for change. The role of tenure-responsive planning for designing innovative flexible tenure arrangements within transhumance systems illustrates its importance (see Box 2). Practices of pastoralism in Sudano-Sahelian West Africa involves 70-90% of livestock moving away from home territory over the course of a year. This mode of pastoralism, that requires a host of tenure rights at different sites along its route in order to sustain livestock, is under threat. Take the case of transhumance in Eastern Senegal where greater variability in climatic conditions is increasing stresses on a form of production that requires a “socially porous open system of tenure” but is under pressure through encroaching agriculture to establish “spatially-fixed, exclusionary forms of tenure” . This has been called the “paradox of pastoral land tenure”. In such a condition, working through a tenure-responsive planning mode, researchers have proposed a middle-ground approach that provides flexible access within a fixed network of corridors for facilitating livestock mobility. This involves identifying spatially-fixed components such as encampment sites, water points, and corridors. Legislation can identify and protect these middle-ground tenure arrangements. The multiplier effect of well-designed tenure institutions and planning platforms can provide a strong basis for adapting to and mitigating climate change by leveraging the knowledge, assets and financial capital of key stakeholders to determine appropriate sustainable development pathways into the future. Freudenberger, M. & Miller, D. 2010. Climate change, property rights, and resource governance. Emerging implications for USG policies and programming. USAID Issue Brief. Washington, DC: USAID. Available at: https://landportal.org/library/resources/climate-change-property-rights-resource-governance. Hilton Prize Coalition. 2017. Land tenure as a critical consideration for climate change-related displacement in slow-onset disaster zones. Available at: https://landportal.org/library/resources/issue-brief-land-tenure-critical-consideration-climate-change-related-displacement . Caron, C., G. Menon, and L. Kuritz. 2014. Land tenure and disasters. Strengthening and clarifying land rights in disaster risk reduction and post-disaster programming. USAID Issue Brief. Washington, DC: USAID. FAO. 2013. Governing land for women and men. A technical guide to support the achievement of responsible gender-equitable governance of land tenure. Rome; Food and Agriculture Organization. Available at: https://landportal.org/library/resources/landwiserecord414item447/governing-land-women-and-men-technical-guide-support. Kasimbazi, E. 2017. Land tenure and rights for improved land management and sustainable development. Global Land Outlook Working Paper. United Nations Convention to Combat Desertification. Available at: https://landportal.org/library/resources/land-tenure-and-rights-improved-land-management-and-sustainable-development. USAID. 2015. Land tenure and climate-smart agriculture. USAID Issue Brief. Washington, DC: USAID. Available at: https://www.land-links.org/issue-brief/land-tenure-and-climate-smart-agriculture/. Patwary, O. H. 2016. Climate change and displacement: the case of Bangladesh. International Journal of Arts and Sciences, 9, 2: 565-580. FAO. 2017b. Improving ways to record tenure rights. Rome: Food and Agricultural Organization. Available at: https://landportal.org/library/resources/improving-ways-record-tenure-rights . Doss, C., Kovarik, C., Peterman, A., Quisumbing, A.R., & Bold, M. van den. 2013. Gender inequalities in ownership and control of land in Africa. IFPRI Paper no. 1308. Washington, DC: IFPRI. Available at: https://landportal.org/library/resources/landwiserecord1828item1842/gender-inequalities-ownership-and-control-land-africa . U.N. Statistical Commission. 2017. UN methodological guidelines on the production of statistics on asset ownership from a gender perspective. New York: U.N. Statistical Commission. Available at: https://landportal.org/library/resources/un-methodological-guidelines-production-statistics-asset-ownership-gender. Van der Molen, P. & Mitchell, D. 2016. Climate change, land use and land surveyors. Survey Review, 48, 347, 148-155. DOI: 10.1179/1752270615Y.0000000029. Djoudi, H. & Brockhaus, M. 2016. Unveiling the complexity of gender and adaptation: the “feminization” of forests as a response to drought-induced men’s migration in Mali. In C. Colfer, B.S. Basnett, and M. Elias, Gender and forests. Climate change, tenure, value chains and emerging issues, pp. 150-168. London: Routledge. Global Land Tool Network. 2010. Tackling tenure security in slums through participatory enumerations. Brief no. 1. Nairobi: Global Land Tool Network Secretariat. Available at: https://www.gltn.net/jdownloads/GLTN%20Documents/2992_alt.pdf.